Janet emailed me a link to the W2O campaign, which wants to discard Andrew Jackson from the $20 and replace him with a noteworthy woman. The campaign has its own list of candidates, mostly human rights icons and politicians. I’d call Rachel Carson the only nonpolitical candidate, since she’s a scientist. But since climate denial has become a popular political cause, Carson’s choice would also be considered political. [Not sure why I’m ignoring Clara Barton – maybe I’d be more excited if she’d been a physician like Gramma Doc]. Cousin Peter suggested Grace Hopper, and I love the idea. If you’re using the Internet and you don’t know who Grace Hopper is, you should go watch the 17-minute video “The Queen of Code.” In a nutshell, Hopper was a giant of the computer field in the early days. She first worked on the Harvard Mark 1 as a naval officer during World War II, and then on the first Univac computer. She’s most famous for work on programming languages. Her work on COBOL brought “automatic programming in an English-like language” to businesses, making it practical for more of them to use computers. CJ emailed me this link to a Bonham’s auction last summer. 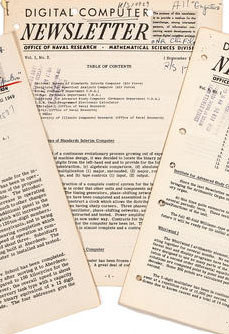 They sold a “complete set” of the Digital Computer Newsletter, a periodical Dad started in the late 1940s to share information about computers under construction or in operation. The issues range in date from 1949 through 1962. This is one of the earliest computer technology periodicals out there. The auction brought over $4,000. Unfortunately we didn’t keep a “complete set” like that ourselves. I have the first issue tucked away at the bank, and a few other gems. I don’t know what the other items are worth.